Working in an office environment often means using a computer monitor for long periods of the day. In fact, according to some studies, the average person spends a minimum of three hours using a computer every day. Office workers who use computers for a large portion of their work end up averaging closer to 7 hours of computer use per day. This makes creating a healthy workspace of vital importance to your employees’ health and productivity. In this blog post, we will discuss the importance of adjustable monitor arms, the injuries they can prevent, and why every computer user should have one at their desk. According to Yale University, ergonomics is the study of interactions between humans and objects or tools. The next obvious step of that study is to determine then how tools can be improved to make that interaction more natural. 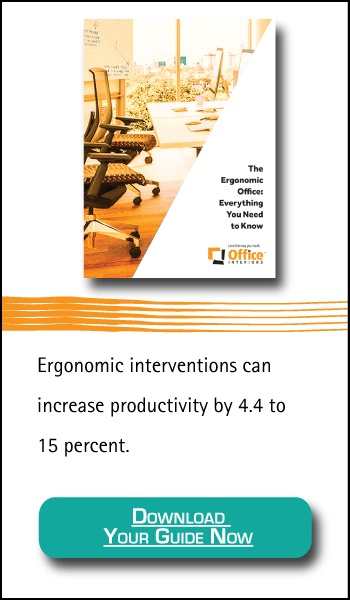 This science is so crucial because ergonomic injuries are a genuine risk for people in all lines of work, including office workers. The good news is that many ergonomic injuries can be prevented with the correct tools and procedures in place. Best of all, ergonomic accessories like adjustable monitor arms can have a considerable impact on employee health and happiness without putting a substantial dent in the company budget. Why Use Computer Monitor Arms? Many people initially do not understand the need for adjustable computer monitor arms. After all, most monitors sit on a desk and can be slightly adjusted up or down. What more do you need, right? The truth is that the position of a computer monitor can play a significant role in many ergonomic injuries. Far too many people lean, slouch or crane their neck when using a poorly positioned computer monitor. The result of long-term poor posture can be incredibly painful for employees both at work and at home. Chronic lower back pain is one of the most common ergonomic injuries and is most often a result of poor posture. While sitting, your back should rest comfortably against the backrest of your chair. This backrest is meant to support your back muscles while seated. When you lean forward, you force your back muscles to work overtime to hold your upper body still. It’s a similar story for the neck and shoulders. As you lean forward to view your computer monitor you affect all areas of your posture. While leaning forward your neck will crane forward, and your shoulders will roll forward as well. This puts stress on the muscles which can lead to soreness, long-term chronic injuries, and poor posture that’s difficult to correct. Using a computer monitor arm allows you to set up your workstation to ensure maximum comfort while sitting. You will no longer be tempted to lean or slouch closer to your computer monitor, and you can rest your back comfortably on your chair, feeling better at the end of a long work day. In our increasingly mobile work environments, many employees use a laptop as their only computer so that they can seamlessly move from the office to a mobile work environment. Will monitor arms work for them as well? The answer is: yes! There are a couple of different solutions for employees who work on a laptop in the office. The first solution is to have a dedicated monitor and attached monitor arm that they use while in the office. They could use the display to ensure comfort while in the workplace. There are also laptop stands with adjustable arms that act similarly to a computer monitor arm but hold the entire laptop instead. Additionally, there two other advantages to having a monitor arm for a laptop. First, in some cases, this may eliminate the need for a monitor entirely as employees can merely use their laptop display comfortably. Secondly, if employees wish to use two screens, the laptop can seamlessly fit into a dual monitor setup without the need for slouching, leaning, or craning by the user. Of course, an adjustable monitor mount is only useful in preventing ergonomic injuries if you have set it up correctly. A poorly adjusted monitor arm will provide little benefit over having no monitor arm at all. Luckily, setting up a monitor arm is incredibly simple. Follow the monitor arm’s instructions to set up the arm in its desired location and then attach your computer monitor. Next, you need to adjust the height and distance of your monitor to enjoy the benefits of a monitor arm thoroughly. Sit down comfortably in your chair with your back against the backrest and your feet flat on the ground. Now you can adjust the position of your monitor to meet your own needs. Your eyes should align just below the top of the display, and the monitor should be about an arm’s length away from you. The setup outlined above will ensure you can see everything on your display without craning your neck, leaning, or slouching. An adjustable monitor arm is an excellent addition to any workspace. These affordable ergonomic accessories are easy to set up and use which makes them one of the top accessories available. Most importantly, a computer monitor mount can have far-reaching positive effects beyond just the workplace. Reduced back, neck, and shoulder pain will ensure that you can enjoy life to its fullest both at work and beyond those office walls. Want to learn more about which ergonomic tools you should be using? 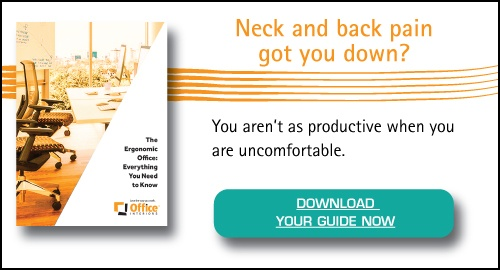 Check out our comprehensive guide to Office Ergonomics.